The Mayor of London has said Britain leaving the European Union without a Brexit deal would be the worst possible outcome. Speaking in Dublin today, Sadiq Khan has called on British Prime Minister Theresa May to withdraw Article 50 if the agreement she reached with the EU is voted down by the British parliament next week. He said the prospect of a 'no deal' Brexit must be taken off the table by Mrs May, to avoid Britain falling off a cliff edge and to "allow breathing time to decide how to resolve this mess." In an address to the Dublin Chamber annual lunch this afternoon, he said: "The worst possible outcome - which remains a grave concern given the political uncertainty in Westminster - is that the UK leaves the EU with no Brexit deal at all." Mr Khan said such a scenario "would not only be devastating for London's economy, but would actually hurt businesses and economies across Europe, including here in Dublin, and increase the chance of a hard border on the island of Ireland". He also said he believes that regardless of the outcome of Brexit, "the special relationship between Dublin and London" will be maintained. Mr Khan, who was a prominent pro-EU campaigner during the 2016 referendum, is holding talks this afternoon with the Taoiseach Leo Varadkar at Government Buildings. 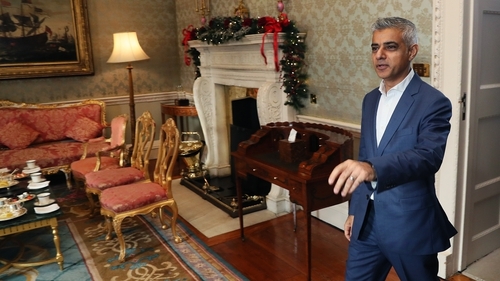 Earlier, the London Mayor met with President Michael D Higgins at Áras an Uachtaráin.